The Sanford FIELDHOUSE's professional-quality indoor soccer facility is a 95 x 65-yard Field Turf® playing surface that is large enough for a full 11 v 11 game. Floor-to-ceiling nets allow the area to be divided into halves or quadrants for training and small-sided games. 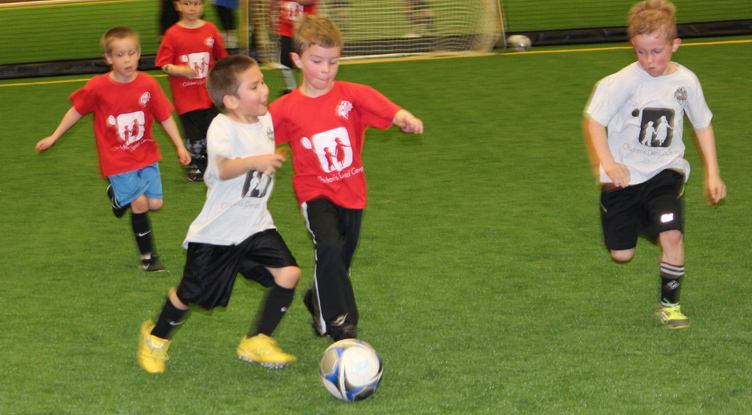 The FIELDHOUSE is the indoor home of the Dakota Alliance Soccer Club's winter programs. Every year, more than 7,000 youths ranging from 3 to 19 participate in the Dakota Alliance Soccer Club's recreational and competitive programs. They annually graduate 20-30 players into collegiate soccer programs. The indoor soccer facilities will host several large regional tournaments every winter. Sanford athletic trainers will be on site during soccer training programs and events. The turf is available for rental. Please contact us for more details on rental. The Dakota Alliance Soccer Club is a non-profit organization that specializes in providing quality soccer experiences for youth ages 3 – 19. DASC is dedicated to providing the youth of Sioux Falls and surrounding communities enjoyable soccer experiences with opportunities to improve through a variety of programs. The Club has a level of play for every player desiring a leisure experience to those wishing to reach their fullest potential. For more information please visit the DASC website www.dakotaalliancesoccer.com or call the DASC Office at 605-332-5911. Click here for DASC program information.